Powerful brands are built by creating and maintaining strong identities. The following information serves as an introduction to The University of Texas at Austin School of Architecture's identification program. All communications emanating from the school should reinforce this identity. These standards have been specifically created for the school and should be adhered to consistently. If you notice specific situations or communication vehicles not addressed in these guidelines — or if you simply have questions and need help with identity applications — contact the Chief Communications Officer, Stacey Kaleh. Our school's identity is in your hands. Treating it with care, clarity, and consistency will guarantee its success. Our brandmark (logo) is the most important graphic element used to identify the school and must be used on all official material coming from UTSOA. In order to command full attention and maintain visual integrity, the UTSOA brandmark must have a minimum amount of clear space equal to the height of the shield around it in all applications. See example below. The brandmark should not appear to be crowded by other elements. The UTSOA brandmark should never be reduced to a linear shape, surrounded by an outline, stretched, extended, or manipulated in any way. Brandmarks may only be reproduced in the proportions, formats, and colors specified below. No distortions or modifications of the brand are permitted. The nomenclature of the following configuration titles was formulated by the university. For downloadable files, click the text names under "Description of Use." Formal The school recommends the Formal or Branded configurations for most applications. Branded The school recommends the Formal or Branded configurations for most applications. Program Available for Architectural History, Community and Regional Planning, Historic Preservation, Interior Design, Landscape Architecture, Sustainable Design, and Urban Design. Center Available for the Center for Sustainable Development and the Center for American Architecture and Design. Primary The Primary configuration emphasizes "Texas." There will be times when it is appropriate to use the brandmark over a dark background color. In these situations, the logo may be inverted. For assistance in determining correct usage, contact Stacey Kaleh. The School of Architecture brandmark must have a minimum amount of clear space equal to the height of the shield around it. Refer to the style guide for spacing details and minimum size requirements on each brand configuration. As instructed by the style guide, the brandmark may be used in most print and digital projects without additional approval. Any proposed use of the brandmark on merchandise (such as, but not limited to, t-shirts, mugs, pens, hats) must have prior written approval from the UT Office of Trademark Licensing and be produced under a licensing agreement by an approved vendor. For usage of the brandmark on sponsored material, please contact Stacey Kaleh. Our primary color is burnt orange Pantone 159. Our secondary color is gray Pantone 432. 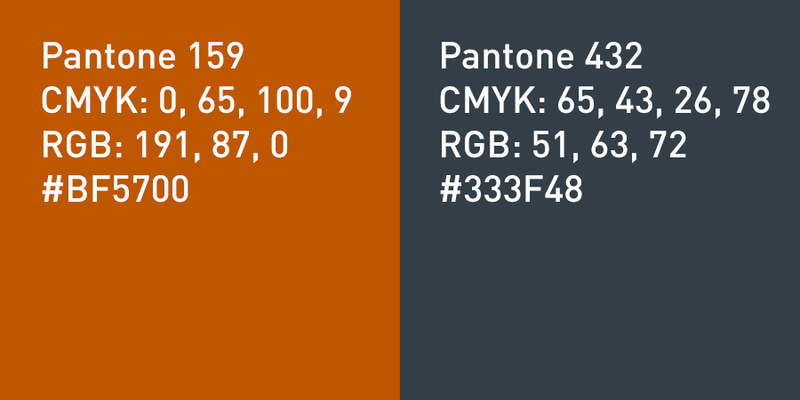 Find the CMYK, RGB, and HEX values of each in the chart below. The full palette of UT Brand Identity Colors. The font used in the new wordmark is GT Sectra. Chosen for its legibility, as well as its nod to academia, it is a contemporary serif typeface combining the calligraphy of the broad nip pen with the sharpness of the scalpel knife. The School of Architecture uses BentonSans (sans serif) and Garamond (serif) for most print publications. GT Sectra (serif) is also acceptable. The majority of users will already have Garamond fonts installed on their computers. DIN and GT Sectra downloads are available below. Download GT Sectra fonts (Regular, Regular Italic, Book, and Book Italic). Some print projects may require a broader range of weights than offered above. If your project requires additional BentonSans or GT Sectra fonts, contact Stacey Kaleh or request a license. Business cards can be ordered directly from the UT Copy Services. Students may use a credit card or pay cash at a Copy Center office. At this time, you may choose from among three designs. Two designs use the university seal (a serif version and a sans serif version), and one design incorporates the new university brandmark. The School of Architecture has a supply of letterhead, envelopes, and branded correspondence cards available for faculty and staff use, located in the Dean's Suite. Centers, programs, and business offices may order their own stationery for a reasonable cost directly through University Printing Services. Ordered in increments of 500, letterhead and envelopes can be "customized" to include program/center name, web address, or other specifics. UT EID and account number are required, and payment can be made through IDT. When you need to deliver your message through e-mail or other electronic transfer, electronic letterhead is permitted, provided the correct template is used. A digital version of the school letterhead is available (to faculty and staff) as an MS Word template. Contact Stacey Kaleh for the template. To ensure consistent formatting across multiple devices and software programs, save your letter as a PDF file. The university has provided guidelines for email signatures. The School of Architecture recommends using this format instead of the brandmark file, which email recipients receive as an attachment. Faculty and staff may use PowerPoint templates with School of Architecture branding. Two format options are available for download in three different color themes. 4:3 Ratio: The default projector slide ratio of 4:3. The standard size for a 4:3 template is 10"w x 7.5"h.
16:9 Ratio: When using PowerPoint presentation on TV screens. The size for a 16:9 template is 10"w x 5.63"h.
The university offers PowerPoint presentation tips here. The university has extensive writing guidelines available online. Topics include the correct usage of abbreviations, capitalization, punctuation, dates and numbers, tricky words, and more. View the university writing guidelines here. Below are several examples showing how to reference the university, the school, degree programs, and titles. When writing for internal audiences familiar with the university, it is acceptable to refer to the university as "UT Austin" (do not use a hyphen). The full, correct title of the school is "The University of Texas at Austin School of Architecture." It may also be referred to as “the School of Architecture." Use lowercase “school,” not “School,” when it stands alone. Capitalize the names of degree programs except when used in a person’s title. Correct: He's a student in the Community and Regional Planning Program. Correct: She's a community and regional planning professor. Use lowercase for the word “program” when it stands alone. Correct: She's been in the program for three years. Capitalize the discipline when it’s used to mean the degree program. Use lowercase for the discipline when it’s used in a general sense. Correct: She's a professor in the Sustainable Design Program. Correct: She's a landscape architecture professor. Correct: He majored in interior design. Correct: She received a master's degree in architectural history. An individual’s title is capitalized only when used before the name. Do not capitalize an occupational designation, only a true title. Correct: We met Dean Michelle Addington. Correct: The dean will speak at the symposium. Correct: Assistant Dean for Administration Jeff Evelyn issued the memo. Correct: Our speaker will be architect Bjarke Ingels, principal at Bjarke Ingels Group. Correct: Her years of hard work were acknowledged when she earned the rank of professor emeritus. Titles following an individual’s name should appear in lowercase. Use lowercase when a title is used alone. Correct: The dean of the School of Architecture will address the group. Correct: Allan Shearer, associate dean of the School of Architecture, will host the reception. The official names of honorary chairs and university professorships should always be capitalized. Correct: Michael Benedikt, the Hal Box Endowed Chair in Urbanism, published a book.